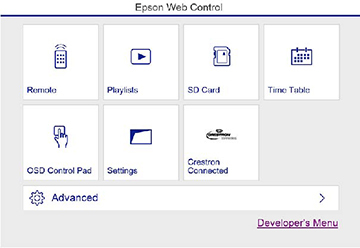 Once you have set up your projector to use Crestron Connected, you can control and monitor projection using a compatible web browser. Start your web browser on a computer connected to the network. Select the input source that you want to control in the Sources List box. You can scroll through available sources using the up and down arrows in the box. To control projection remotely, click the on-screen buttons that correspond to the projector's remote control buttons. You can scroll through button options at the bottom of the screen. To view information about the projector, click the Info tab. 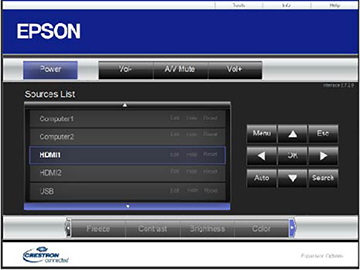 To change projector, Crestron, and password settings, click the Tools tab, select settings on the displayed screen, and click Send. When you finish selecting settings, click Exit to exit the program.